Crew. . 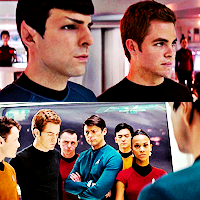 Images in the Star Trek (2009) club tagged: star trek 2009 crew kirk spock sulu uhura chekov scotty bones. This Star Trek (2009) icon contains portrait, headshot, and closeup. There might also be business suit.